A Melbourne based writer who is a travel junkie, dedicated foodie and emerging photographer. I have to admit that Moorabbin is a little out of my usual dining zone. 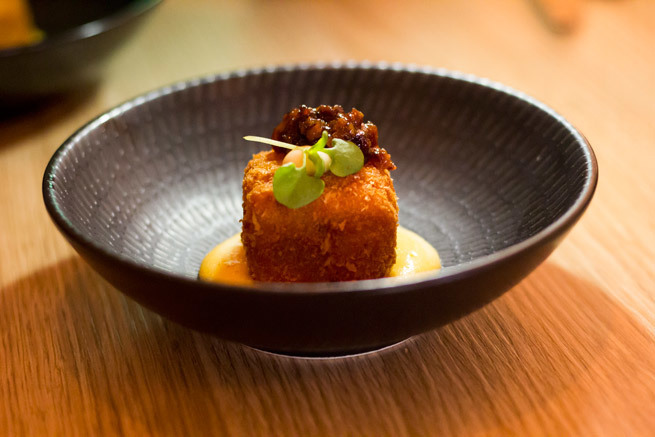 But handily located right across the road from Moorabbin train station is a new restaurant that will set the standard in contemporary dining in Melbourne's south-east - Chameleon Junction. Walking into the venue, I couldn't help but be impressed by the delightful, modern decor, which included thoughtful design features such as tables along the walls on runners for easy reconfiguration of the table set up, and adjustable overhead lights. 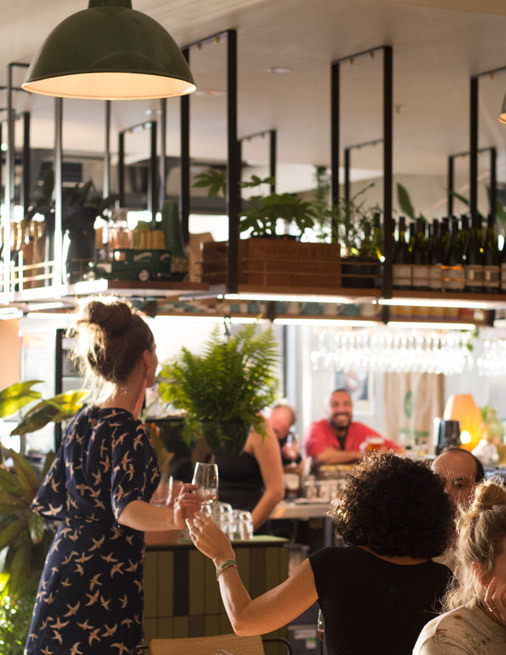 There's an extensive bar, a series of dining zones separated by planter boxes, and a large open window to the kitchen at the back of the restaurant. Chameleon Junction really impressed with a degustation dinner and matched drinks I recently attended. Despite a crowded restaurant, it was service with a smile the whole way through, making it a memorable night. 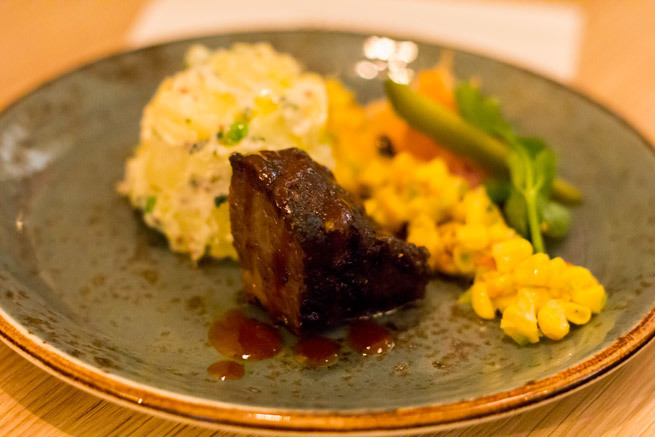 While the full menu has not yet been posted on the website, a scan of the reviews on the restaurant's Facebook page, along with the dishes I sampled, described below, will give you an idea of the style of cuisine on offer. Please note that as the dishes sampled were part of a degustation, the portion sizes depicted may be smaller than if ordered off the menu. We started with sardine on crostini with pickled vegetables ($3 each), matched with a Printhie 2014 Riesling ($8.50 per glass). I love sardines so this dish was a winner for me. 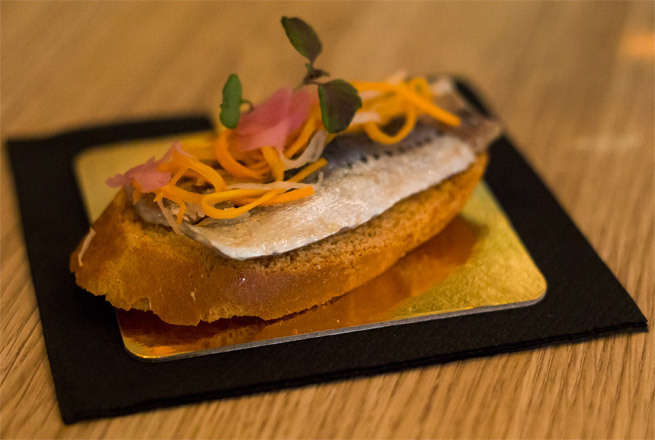 The crostini was perfect in its crunchiness, and the pickled vegetables were an inspired match with the fish, giving extra texture and flavour. The wine was a slightly sweeter style riesling, soft and fruity, and worked well with the sardines. Second up was mac 'n' cheese croquettes with bacon jam and Hollandaise ($9 for four pieces), matched with a Parini 2016 Pinot Grigio ($9 per glass). These indulgent croquettes risk being stodgy, but these weren't - they were five star deliciousness. Not only was there the perfect crispy crust, but they had a delightful pepperiness in the filling that, combined with the slightly sweeter bacon jam, gave the dish a complexity not normally found in a mac 'n' cheese croquette. Yum! The dishes to follow were lamb kofta with a citrus couscous and raita ($9 for 3 pieces), matched with an Albino Armani 2016 Rose ($9.50 per glass); soba noodles with greens, tofu and sesame ($19) paired with a Helen's Hill 2012 Arneis ($10 per glass); and beef rib with corn salsa and potato salad ($27), matched with a Hacker 2016 Sangiovese ($10 per glass). My partner David declared the soba noodles 'dish of the night', and they were certainly light and refreshing. But it was the amazing house-made sesame dressing that took the dish to another level - so rich and flavoursome. I wasn't familiar with the Arneis wine, so did a bit of research. Originally an Italian varietal, its name is derived from a Piedmontese word meaning "little rascal" (because it is notoriously difficult to grow). Helen's Hill is now successfully growing it in the cooler rolling hills of the Yarra Valley. The first thing I noticed was its gorgeous floral bouquet. It's an easy to drink style, with stone fruit notes. Aged in oak, it is a little like a chardonnay. Moving to dessert courses, we were first served black porridge with banana and coconut, which was matched with Frangelica and lime. The black porridge is actually on the breakfast menu ($15) (did I mention breakfast is served until 3pm every day? ), so it was perhaps a challenge to work out a suitable matching drink. But the Frangelica complemented the dish beautifully with its knockout hazelnut flavours. Again, I'm a big fan of black porridge, and the moist coconut flavours through this wild grain dish made it a pleasure to eat. Final dish of the night was the buttermilk panna cotta, with raspberry jam and ivory sauce, matched with a Tim Adams Botrytis Riesling ($8.50). 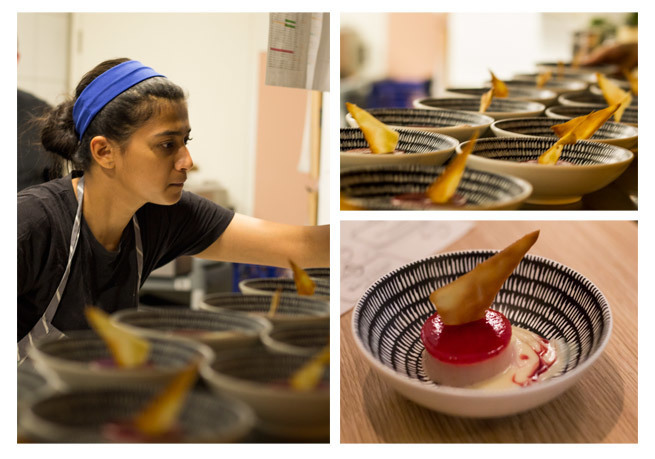 Immediately appealing with its crispy sail, this beautiful dish cleverly balanced out the sweetness of the panna cotta with the slightly tart fruitiness of the raspberry jam. It was a strong finish to a delightful meal. What gives Chameleon Junction its 'good karma' points is that it has a strong focus on eco friendly and environmentally sensitive practices, including using biodegradable coffee cups, lids and takeaway food packaging, composting of coffee grounds (by their organic egg farmer), and eco friendly cleaning products (right down to the hand soap in the bathroom). The restaurant gets huge points too, for being open for such amazingly long hours, every day: from 6.30am to 11.00pm. So whether you want to grab a coffee before work, enjoy a leisurely weekend brunch or have a relaxed drink or bite to eat at the end of the day, Chameleon Junction is your go-to place! Do check it out. Chameleon Junction is located at Shop 4, 4-6 Station Street, Moorabbin. The large size of the venue means reservations are not necessary, but if you want to discuss a function or large group booking, you can contact the restaurant on (03) 8525 1757. The images in this article were taken by the writer.